A dramatic weekend of D2 football has passed including a draw between Sporting SC v. NYPD FC and Real Olé FC and CPR Reds, the Kickers sending 4 past FC Japan and FC Ulqini's narrow victory against Beyond FC and we recap them today in preparation of tomorrow's fixtures of the Cosmo League D2. The Kickers came to play against a FC Japan side coming back from a great season opening 3-1 result against Panathinakos USA. As a result, Manhattan Kickers won 4-0 against the Japanese side Saturday night at Randall's Island. Manhattan Kickers managed to take control of the game towards the second half of the match at Randall's Island Field 75. Jesus Gonzalez found the gap and opening the scoring early before Brian Morris managed to cut through the defense to run at goal, shoot and make it 2-0. Goalscorer Morris turned creator to Almir Hot to make it 3-0, and would finally end the scoring near the dying minutes of the game with Fook Liao dribbling past FC Japan goalkeeper Tomoharu Tabei. This result now puts the Cosmo League veterans top of the table in the Southern 2nd Division thanks to their back-to-back wins. FC Japan couldn't repeat their game-winning performance against Panathinakos USA early into Week 1 that earned them 3 points and picked their first loss of the season. However, spirits aren't crushed as of yet as they have collected 3 points and only sink to 6th place, whereas teams like Panathinakos, Williamsburg International and NY Ukrainains all sit below of them in the South. Tomorrow, they will face up against Beyond FC, a team who are coming back from a loss this past weekend. Nothing seperated NYPD FC or Sporting SC from collecting a win as both ended up with just the single point in a dramatic 3-3 tie at Flushing Meadow Field 5. Ed Romero was quick to dispel any certain outcomes for Sporting against this NYPD side that was previously dismantled by KidSuper Samba AC 8-1. The Sporting Head Coach told the Cosmopolitan Soccer League just how tough NYPD would be after a loss like that. "What happened against KidSuper Samba we couldn’t take seriously. They won and tied against Samba last season. After an 8-1 loss, we all expected them to come ready to win. And they did." Sporting SC also suffered from a decreased roster, according to Romero. "Now we only had 12 guys and we played under tough conditions...NYPD had a full 18 man roster." With NYPD dominating some of the early chances in the game, they scored 2 goals before going 3-2. Just as NYPD FC started take control of the game before the end of the match, Sporting made it 3-3. "They went 2-0 then 3-2. But we never gave up. Our keeper made a goal line save, then our midfielder Jairo Eligio hit a 22 yard strike to equalize with minutes left. We missed a great chance to get 3 points but given the conditions and playing away we will take it." said Romero. "KSS finished second and kicked our butts last season. If we have a complete roster I like our chances. We are really coming together as a team. All I can say is that we will look to come out of our match with a positive result." After their huge 8-1 loss to Samba AC in Week 1 of the Cosmo League 2nd Division, NYPD FC were determined to grab a result against a Sporting side that finished 8th in the North last season. They were firmly keeping grasp of the flow of the game at the beginning but couldn't keep the pace as Sporting started to come back after back-to-back goals. With this draw, they now sit in 7th in the North with a single point and will play their next fixture in Week 4 as they have a Bye Weekend. Polonia Gwardia NY faced off against Panathinakos USA in Week 2 and won handsomely 3-0 at Randall's Island Field 75. Panathinakos USA has collected back-to-back losses this season and haven't been able to pick up their mojo since their last season's disappointments. With a tendency to start games strong but never follow through, they now sit bottom of the Southern 2nd Division with their next game against the Kickers in Week 4 of the CSL proving to be more MOUNTAIN than obstacle. Polonia Gwardia's Head Coach Michael Siwiec has seen his team start the season perfectly, with the second straight win against Panatha. They now sit tied with Manhattan Kickers on points with 6 and are set to face FC Ulqini tomorrow afternoon, September 23rd. Beyond FC played against Stal Mielec NY at Laurel Hill Field in Secaucus, NJ this past Sunday and left without any points as Mielec won in a 1-0 result. Back in the first matchday of the season, Beyond FC made quite the statement putting 5 past Ulqini in their win at the Greenbelt Rec Center in Staten Island. However, they couldn't pull off a result as Stal Mielec NY won 1-0. As it stands, they will go into Week 3 facing FC Japan sitting in 3rd place in the Southern Division with just the 3 points from their previous win and a goal difference of 2. Polish outfit Stal Mielec NY started the season with the right fighting spirit as they start this season with the "W". Pawel Marczenia scored the only goal of the game, thanks to a great assist from Jacek Lawniczak. They now sit 4th in the South, level on points with Beyond at 3 but underneath them on goal difference with this encounter being their first game of the season. They will face 1st placed Manhattan Kickers in the Lower East Side at East River Field this weekend. FC Ulqini managed to recover from a rough 5-2 loss to Beyond FC in the best way, picking up a win over NY Ukrainians in a dramatic 4-3 result. "We respect our opponents and always expect them to give us a tough match. We had a 3-3 draw and a 3-0 win against Ukrainains last year. We also beat them 2-1 in the Flamhaft Cup semifinal. We know them well and we are looking forward to a great game. It's unfortunate, we played them well and it was a great opportunity to pick up points against arguably the top team in D2." - Williamsburg Representative Charles von Rosenburg on facing NY Ukranians this weekend. NY Ukranians now suffered two rough losses this season and have their work cut out for them as they will face Williamsburg International FC going into tomorrow's matchday. With a severely cut roster in comparison with last season, they nearly got a result against D2 debutants FC Ulqini. They sit in 8th place in Southern Division with a negative goal difference of -4. Recovering from a hard loss isn't easy but Coach Agim Ceka and the rest of FC Ulqini did it the hard way and came back to win their match against the Ukranians in a rowdy 4-3 win. One of the latest additions to the Cosmopolitan Soccer League's 2nd Division, FC Ulqini now sit in mid-table with 3 points and a negative goal difference of -2 and will face off tomorrow afternoon against favorites, the highly rated Polonia Gwardia NY at the Greenbelt Recreational Center in Staten Island. Real Olê FC versus Central Park Rangers Reds was 90 minutes of non-stop action, resulting in a 6-6 draw and creating quite the split for them in the Northern 2nd Division table. Player Coach Patrick Alvarez and Real Olê FC knew their opponents were tough and the odds were against them but were nonetheless were pleased to leave with a point. "They play a high tempo at the beginning. They they started to slow down after we started to control the game. They just wouldn’t give up." Alvarez told the Cosmo League after the match. "It was a hard fought draw. We were up by two with ten minutes left and it slipped away." "Solid start for our season. Considering this is literally the club's second game ever and we haven’t lost, is a testament to our potential." As for tomorrow's encounter with CD Iberia for Matchweek 3 of the CSL D2, Alvarez steadfastly denied another draw on the cards. "We are coming out on top for sure. I have a lot of friends on Iberia, considering we are all from the same area of Galicia, Spain. I know [CD Iberia Assistant Coach] Juan Lagos, an experienced vet in this league, brought in some quality players to rebuild the club to its glorious days. We will not sleep on them." Central Park Rangers still haven't picked up a win yet and have conceded as much goals as they're scoring. They now sit in 6th in the North with 2 points and will play against Brishna at Randall's Island Field 72. Both teams are looking to duke it out this time as they need to pick up points and improve their form if they have a chance of climbing up the table to earn the chance at promotion come next season. Brishna played against the D2 Championship runners' up FC Spring Valley this past weekend at the North Rockland Nardi Soccer Complex in Thiellis, NY and came out the losing side in a 4-2 result. FC Spring Valley sit in mid-table currently thanks to this win last Sunday with 3 points and a goal difference of -1. With them being one of the last season's toughest teams, it's more of a surprise that they haven't sat higher in the table going into tomorrow's fixture against Manhattan Celtic thanks to their loss to newcomers Real Olê FC. However, this win is a secure one and gained them 3 points and good form going into their next encounter. Brishna has lost again and now sit in the bottom of Northern 2nd Division without collecting any points. The Iraqi side, who finished 3rd last season and narrowly missed out a chance to be promoted, will face off against Central Park Rangers Reds tomorrow afternoon at Randall's Island. Finally, Player Manager William Caverly and the rest of KidSuper Samba AC faced off against Manhattan Celtic, with them earning all 3 points in a 2-1 win. 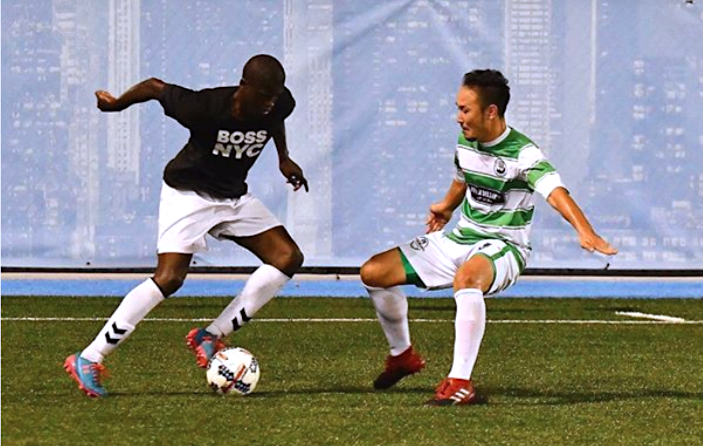 Manhattan Celtic couldn't earn the win to open up their 2018/19 season of the Cosmopolitan Soccer League 2nd Division last Sunday night. They will come back to face FC Spring Valley tomorrow afternoon and hopefully be on the high scoring end. KidSuper Samba AC were one of the more exciting and high scoring teams to watch all of last season in the Cosmo League D2. Left winger Alhoussain Bah was one of the club's stars out there as they won 2-1 over the full 90 minutes as he laid on an assist for RW Khadim Ndiaye to score later on in the game after a penatly was converted nicely into the bottom right corner by Mohamed Fofana. They will play Sporting tomorrow night at the Baker Athletics Complex by Columbia University.